Well, we’re here to tell you that there’s no need to worry! This is a long-awaited change in the WordPress community that will ultimately make updating the content on your website easier. So without further ado….here’s what you need to know. Because showing is easier than telling, you can play around with Gutenberg as if you were editing a page on your website here. The backend editor is still a WYSIWYG, so it will essentially mimic your website’s frontend, making it easier to know how your content is organized. You can now easily add all sorts of elements, including text, columns, images, videos, buttons, and more with the touch of a button! Gone are the days of having to use a shortcode or needing a developer to make styling changes. Now you can do it all on your own using what WordPress calls “blocks.” There’s no coding needed. You don’t need as many plugins to edit content on your site. For example, if you were using Shortcodes Ultimate to build your pages, you probably won’t be needing that anymore. Plugins can be unsecure or cause your website to load slower if they’re bulky. Do I have to make the switch? Eventually, yes. WordPress 4.9.8 was released on July 31, 2018, and it included a callout encouraging people to install it and update. The goal is for Gutenberg to be merged into WordPress 5.0, so when you update to WordPress 5.0, you’ll automatically get Gutenberg. Technically, you can avoid the switch by not updating your website, but that’s a terrible idea and we don’t recommend it. Another way to get around it is to just use the “classic” block, which is virtually the same as the existing editor. There’s also a plugin that you can install on your website that will essentially hide all traces of the new Gutenberg editor. But we don’t recommend any of these approaches unless you really need them. Embrace the change! When do I have to make this switch? It’s not entirely clear when WordPress 5.0 will be released. WordPress has kept it vague and their official website just says 2018. Seeing as they just released WordPress 4.9.8 in late July, it’s probably still a few weeks away as of this writing. Install the Gutenberg plugin on your site. Gutenberg is currently available as a WordPress plugin that you can install and test on your site. As with any plugin, we recommend doing this on a test site or development site – not on your live one! Once it’s installed, you should go through the pages of your website and check to see if anything has broken. Be sure to check both the frontend and the backend. When a site gets converted to Gutenberg, it will attempt to break up all of the components into blocks, but if it runs into an error, it’ll put the entire post or page into a block. If Gutenberg is messing with specific posts, you can use the Gutenberg Ramp plugin to disable it on those post types. Once you’ve reviewed all of your pages under 5.0, we’d actually recommend waiting to push it live until version 5.0.1 comes out. The first minor release will likely have lots of bug and security fixes. So you’ll want to wait until 5.0.1 comes out, update your dev site once it does, review the site once more, and then push it live if it all looks good. Check to see if the plugins you’re using on your site are compatible. An estimated 80.46% of the 55,433 plugins in the WordPress repository have not been tested yet according to Small Business Trends. You can view the Gutenberg Compatibility Chart to see if your plugins have been tested. If not, you can help the community by testing and contributing to this plugin database. Check your theme. Most ThemeForest themes are being updated and will probably work fine, as their developers are working on compatibility updates. You can view their list of Gutenberg-ready themes to make sure yours is on the list. Bonus! We’re working to make sure Ironistic’s theme on our custom websites is Gutenberg-ready. Help make Gutenberg better! WordPress prides itself in being a community, so they want to hear about bugs or incompatibility issues you may be seeing. You can help by giving them feedback, testing, or even contributing to the build. Bonus: Gutenberg’s release and WordPress 5.0 are a great time to do a site audit. A site audit involves taking your live site, copying it onto a development site, and updating WordPress and all plugins. Does this replace my existing page builder? That’s entirely up to you. Major page builders have already prepared for the release of Gutenberg by making their interfaces compatible with the new editor. Both Visual Composer and Beaver Builder have the option of using Gutenberg in place of the Classic editor if you’d like – or you can keep using the classic editor like you’ve been doing so far. One thing to note is that Gutenberg does not have a front-end editor like most page builders do (although we don’t recommend using front-end editors anyway). Why does WordPress change all of the time?! I can’t keep up. I get it. But this is actually a great thing! Gutenberg will ultimately make it easier to update your website, and it’ll be fully compatible with newer browsers. Plus, it’ll save you time since you’ll be able to see what the frontend will look like directly from the WYSIWYG backend editor. There’s a small learning curve, but the time you spend learning how to use Gutenberg will be worth the amount of time you’ll save editing your website in the long run. 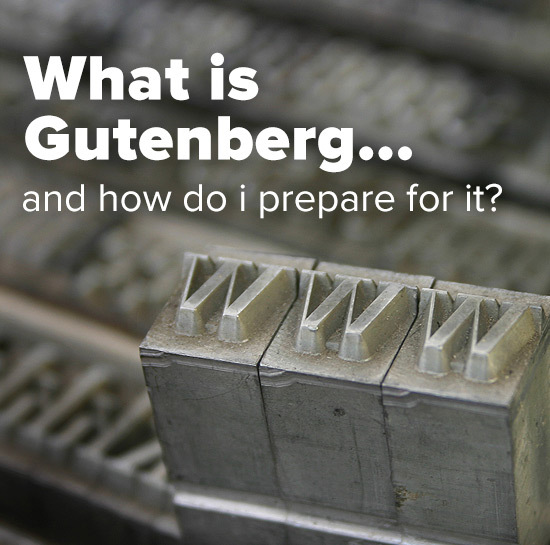 I think the best way to learn Gutenberg is by playing with it, but if you want a more formal class, check out this Intro to Gutenberg course by Gutenberg Courses. You can read about that straight from Matt Mullenweg, one of the founding developers of WordPress.